J. Kyle Keener | Pharos-Tribune – Eric Huber, processing engineer for Winamac Coil Spring in Kewanna, leads a team that is almost done developing a new machine company executives say will greatly aid in its manufacturing of springs. KEWANNA — Six decades ago, Walter Pesaresi bought a grinder for his new company, Winamac Coil Spring, and split it down the middle. “He barely could afford the machine and the first thing he does is take a torch and cut it in half,” Pesaresi’s grandson and plant manager for the company, Chad Huber, said. Pesaresi proceeded to weld the two ends on rails so that it could be expanded, Huber continued, allowing him to grind the ends of larger springs. “It was for some specific jobs and so he got those jobs,” Huber said. Four family generations later, the company continues to apply ingenuity to its machinery to preserve and expand on its clientele. While in the 1950s that could be achieved by cutting a grinder in half, today it requires 3D computer modeling, software programming and robots. Pesaresi started the company in its namesake town of Winamac before moving to Kewanna in the 1950s because of a need to expand and the availability of a former creamery building in the small Fulton County town, Huber said. More than 160 employees currently work for the company, which supplies springs and wire forms to customers across the globe. 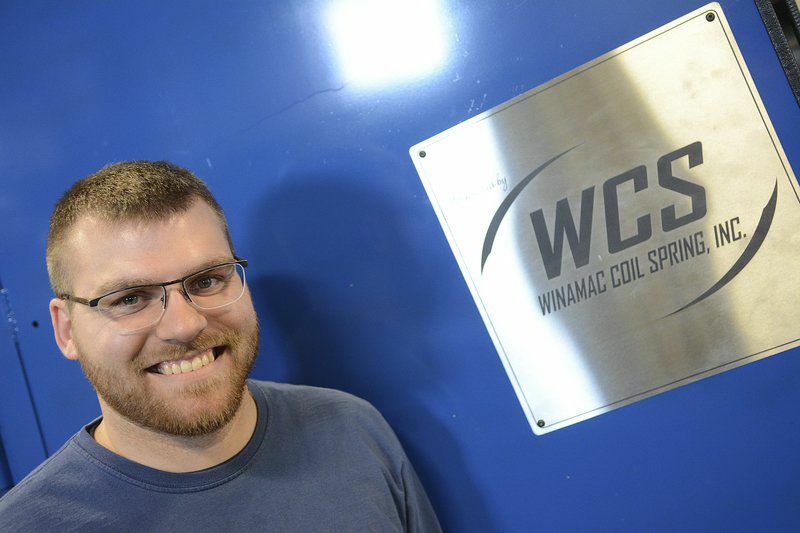 The company is preparing to bring its latest machine into operation after more than two years of design work by Winamac Coil Spring staff. Brian Shafer, sales and marketing manager for the company, recalled how Executive Vice President of Sales Gene Huber Jr. conceived the idea before tasking his son with its creation. “Basically Gene Huber Jr. had the concept and from that concept, handed that down to his son and he took that and basically designed it and built it and brought it to life,” Shafer said. That son is Eric Huber, processing engineer for the firm. “They gave us an idea of what they wanted in October 2014 and my engineering team and I took off with it,” he said. Eric said he designed the machine using 3D computer modeling. 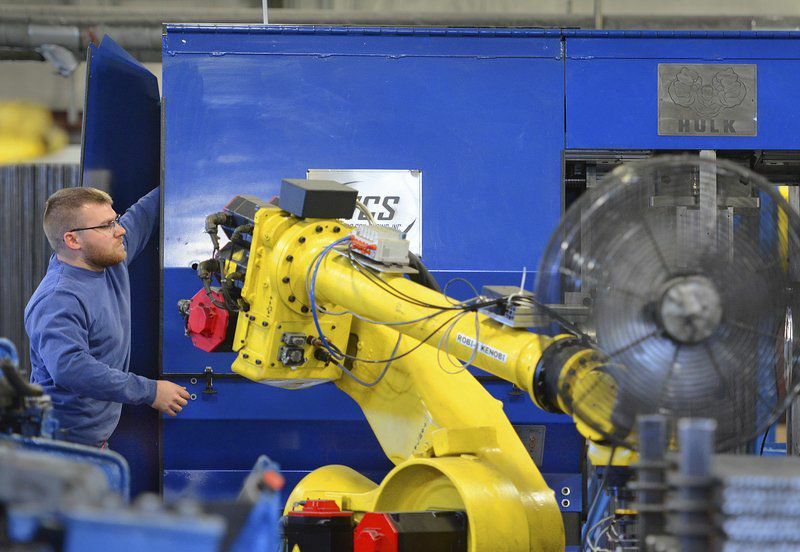 The equipment is automated, Chad said, relying on software and using computer-controlled motors to carry out its tasks while a robot transfers the material from one process to the next until becoming the final product. Many of the parts were built in-house, Chad added. The machine will be used to create double torsion springs, which feature two coils and are “used to neutralize, lift, rotate and/or center rotating loads,” according to Winamac Coil Spring’s website. The site adds such springs are commonly used for harvesting, baler pickups, tillage equipment, lift gates and other equipment. When finished, Chad said it will be able to produce several thousand tons of material an hour each day. He went on to say the desire for the machine is to provide a four-hour turnover from job to job. “We felt like we needed to push the envelope a little bit and this definitely does,” Chad said. Just because the new machinery is automated doesn’t mean the business is cutting workers, Chad said. The new equipment will improve workers’ quality of life, Chad continued, explaining the automation allows them to avoid the wear and tear that comes with regularly reaching into a machine to move material. “This gets rid of that from start to finish,” he said. Chad said projects like this represent values the company has had since its founding. J. Kyle Keener | Pharos-Tribune – Huber represents the fourth generation of Winamac Coil Spring’s family ownership. That culture is shared by fellow staff members, Chad said, from younger employees with fresh technological ideas to those who have been with the company for decades and can apply their knowledge to help make new concepts possible. He’s looking forward to the new machine contributing to the continuation of that dream and vision.